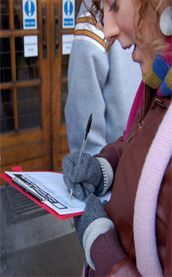 We appeal to you, whether you are an active trade unionist, a community or environmental campaigner, an anti-war activist, or just someone who is fed up with New Labour and wants a party for the millions not the millionaires, to sign up to the Campaign for a New Workers� Party declaration. Do not be daunted because it seems a huge task to work towards the founding of a new party. Compared to the task faced by our forebears we have many advantages. Low-paid and time-poor as we are, our grandparents and great grandparents had far greater practical difficulties, yet they struggled for their own party. We, on the other hand, have their experience to build on � both in showing what is possible and learning from the things that went wrong. Don�t sit back and wait for someone else to build a new party you can join. We need you to get active now. Sign the declaration but also consider going beyond that. Are you a member of a trade union branch or campaigning organisation that might support the declaration? Could you ask someone from the campaign to speak at your next meeting? Are you and/or your organisation able and willing to actively campaign for a new workers� party? If so please contact us immediately. The last decade of the 20th century was marked by an avalanche of pro-capitalist propaganda. The working class worldwide was fed a diet of neo-liberalism, relentlessly being told that there was no choice but to accept endless intensification of work, and cuts and privatisation of services. Given the lack of an alternative being put on a mass level, the propaganda had an effect. The 21st century has seen the beginnings of a change. Worldwide, working-class people are fighting back � with mass strikes in many countries from Belgium to Ireland, from Nigeria to the USA. Here in Britain, working-class people, to some degree, still lack confidence in their collective power to institute change. Nonetheless, some important strikes have taken place. In England and Wales, and many other countries, the foundation of new mass workers� party is a crucial stage in the further development of the struggle. If you want a party that will �fight like tigers� for the working class, if you want to help our class rise from its knees, we appeal to you to join us in this campaign.